The Quidco app: Get paid to shop! 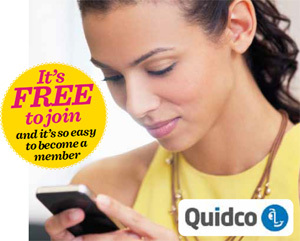 If you’re heading out to the stores, make sure you’ve downloaded the Quidco app to your mobile. Save yourself £££s with personalised offers and deals on the go. The Quidco app lets you discover paid check-in deals, in-store cashback offers and voucher codes local to you. Download the Quidco app free from Google Play or Apple Store. The GPS on your phone tells Quidco where you are. When you visit a store, you will be prompted to check in with the Quidco app to receive all sorts of benefits that can save you £££s – and you get paid!